There are lot of misconceptions about single phase and three phase connections. Many a times people are adviced to go for a three phase connection when they put an AC in their house. People find it difficult to understand when to go for a three phase connection and when for a single phase. We tried to explain it in detail in our article: What are single phase and three phase connections and how to choose between the two?. 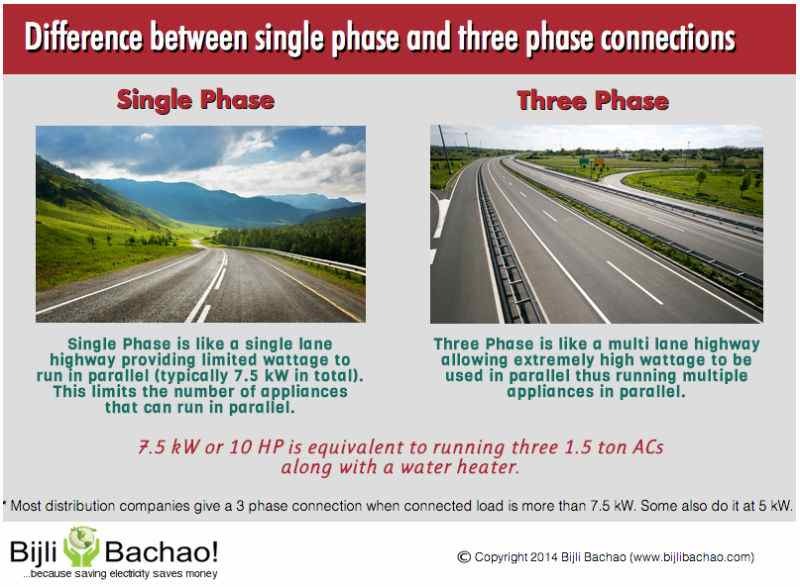 The picture below shows an easy explaination of the difference between single phase and three phase. All residential appliances can run easily on a single phase individually. It is just that when the instantaneous load (appliances working together) is more than 5-7 kW, utilities (electricity distribution companies) suggest going for a 3 phase connection to manage the load better.